It was my twelfth birthday and the goofy appearance of the cake whose candles I’m blowing out indicates that I probably baked and decorated it myself. 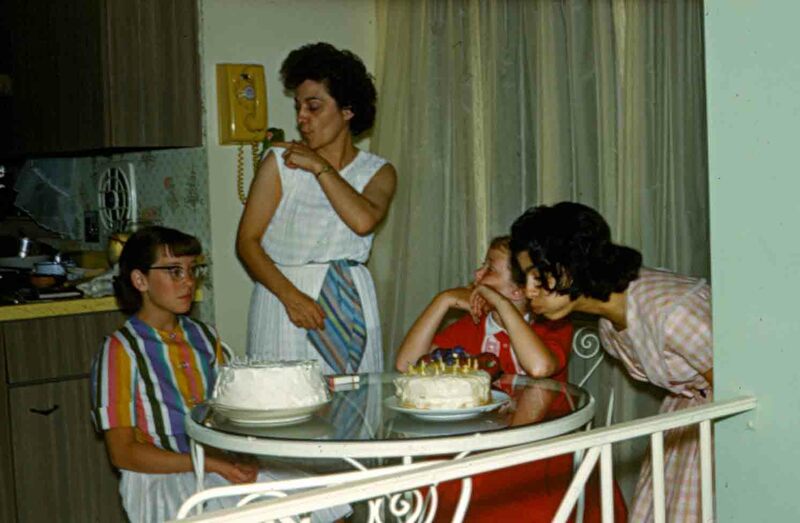 I’m pretty sure my best childhood friend, Betty Lou, in the red dress, helped me in the kitchen, but she seems to have lost interest in the birthday proceedings. My other guest looks ready to cry. Is it because she senses that 48 years later I won’t remember her name? Good old Mom is schmoozing with her Half Moon parrot,“Pookie.” We had acquired Pookie and his little birdie buddy in Guatemala, and my mother became so fond of them that she was determined to have them shipped stateside with our other household effects. Traveling by truck and by train, the pair began their journey together in their cage. I like to imagine that they enjoyed the changing scenery along the way, thoughtfully sending postcards to their Half-Moon friends and relatives left behind. ”Having a great time, wish you were here.” “Caught the Sinatra show passing through Vegas.” “Wow, it sure is flat east of the Rockies.” Alas, only the hardy Pookie survived the arduous overland trek from Guatemala City north to Los Angeles, then across the expansive and varied American landscape to Bethesda. Mom became the sociopathic Pookie’s only companion, because everyone else stupid enough to approach that crazy bird was left dazed and bleeding. One cold winter day, a visiting houseguest forgot to close our back door after letting her fluffy little white dog out to romp in the snow. Poor little Pookie caught a nasty chill and a few days later, with a pathetic squawk, he fell off his perch. The second cake was also for me. I know this because another snapshot shows me blowing out those candles as well. So, who has more fun than people? That’s one of the most hilarious things I’ve ever read. I may never stop laughing. That is such a great picture. Everything is so unnaturally orchestrated.